September 21 – 27 – Craig and L'Or L.
The blood moon won’t be visible here in Fiji, but we’re ok with that. We’re having way too much fun to have the world come to an end. 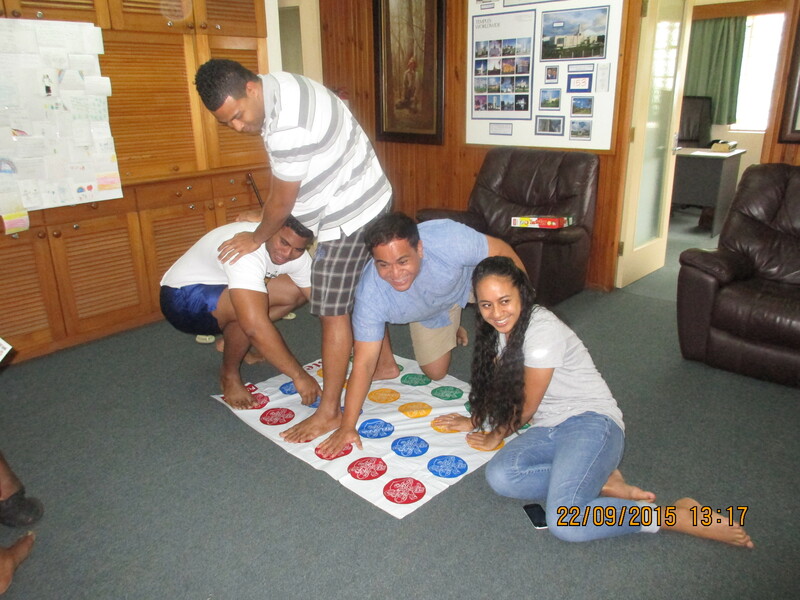 One rainy day last week after our Institute Council meeting, Jeanette, Sean, Manny and David started playing Twister. We don’t know who laughed harder – those who were playing, or all of us who were watching! A new twist on how to get to know our YSAa better. Wednesday we welcomed a new senior couple to the mission – Elder and Sister Smith, who will serve as Self-Reliance missionaries. There is a huge push here to help islanders become more self-reliant, and the Smiths are excited to be part of it. 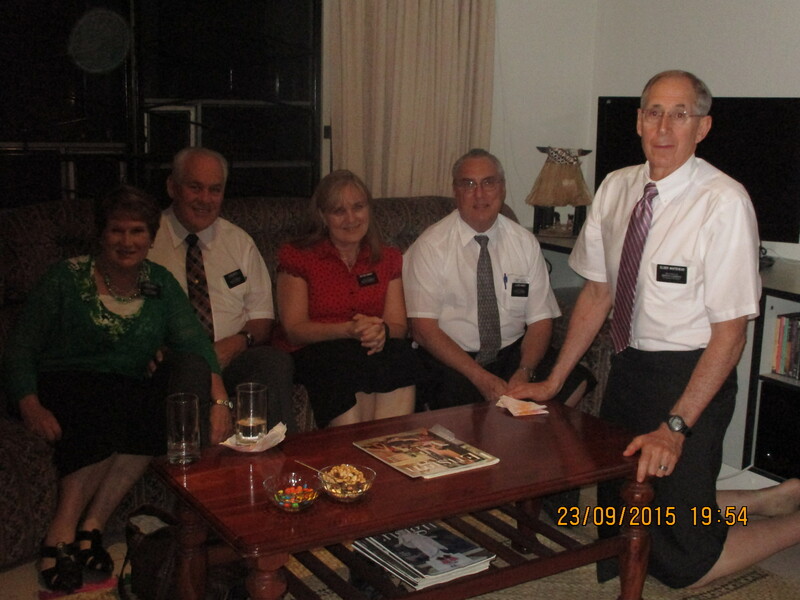 Elder and Sister Smith and the Knights with Elder Whitehead after we had dinner in our flat. Students who want to attend a Church university must take an English as a Second Language test, which Bro Sefeti administers at the institute. Last week both of us had the opportunity to spend some one-on-one time tutoring Onesina, who wants to attend BYU-Hawaii. He needed to prepare for the test because he is from New Caledonia, and speaks French. He’s been fun to have at the institute, and we’ll miss him. We did win, though, and sent him home with treats for the kids. We had planned on going with the senior couples on Saturday to see some spinning dolphins and maybe snorkle, but were told Friday night the trip would take so long we wouldn’t get back in time for our YSA movie night. We were disappointed, but had such a busy day, we were glad we didn’t go. And, as a consolation prize, when we went downtown, there was a parade! Turns out they have one once a month as they change the guard in front of the Presidential Palace (aka Government House). It is the residence of the current president of Fiji, Brigadier-General Ratu Epeli Nailatikau. All that pomp and ceremony just to bring this nice young man to stand guard. 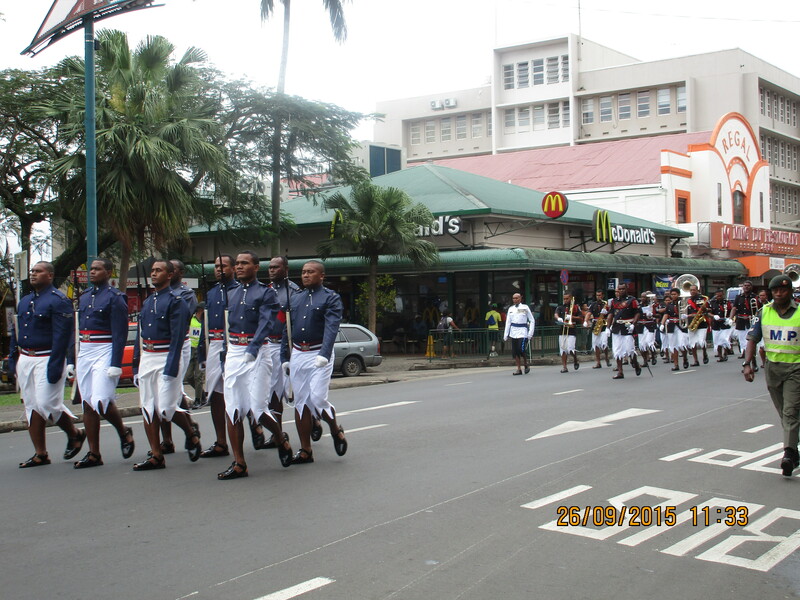 The parade even had a band, seen here marching past one of Fiji’s three McDonald’s restaurants. 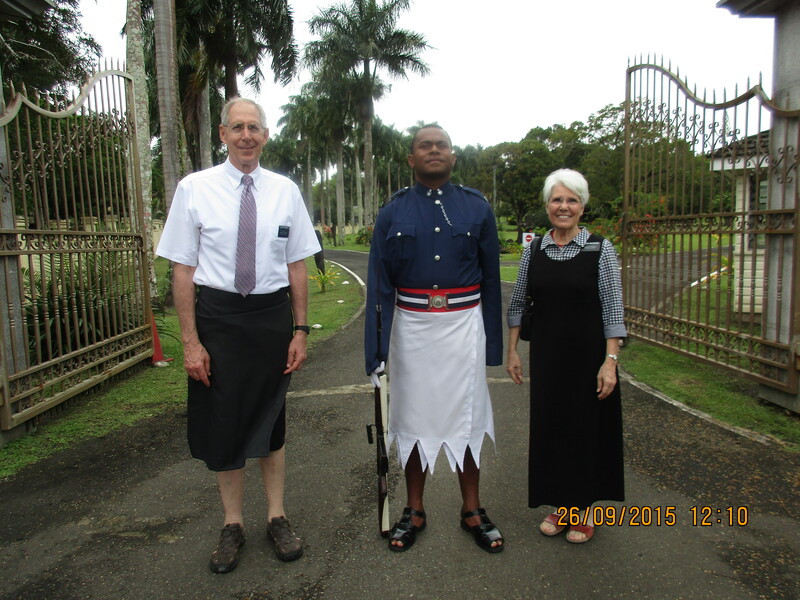 Sunday, Tetika invited us to a fireside he worked very hard to put on for members here in Suva who are from Kiribati. Two songs were printed in program, and we tried so hard to read and pronounce the Kiribati words for the opening hymn, it took us a while to figure out we were reading the wrong hymn! Just to give you an idea why that took so much concentration, one of our YSAs from Kiribati is named Tawatia, which is pronounced Dah-vey-suh. 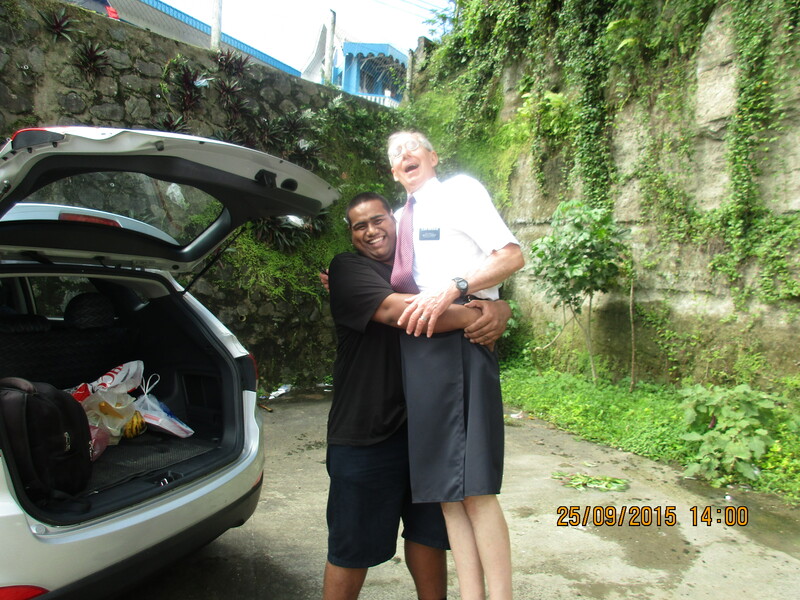 The opening hymn at the fireside was “High on a Mountain Top.” I wish the people of Kiribati had a high mountain top! The island of Kiribati is almost completely flat, and because the ocean water is rising, the island is disappearing. The government of Kiribati is trying to purchase land on one of the Fijian islands so the people of Kiribati people can relocate. I spoke to a couple after the fireside, and they told me how some homes on Kiribati are already under water. They expect the entire island to be completely underwater within 50 years, and are sad that none of their children will be able to raise their children in Kiribati. One objective of the fireside was so see if there would be enough members from Kiribati to form a branch here in Suva. Because 130 attended (don’t know if they counted us) a member of the stake presidency ended the fireside by saying that they will now work on forming a Kiribati branch. It was such a joy to hear the speakers at the fireside express themselves so sincerely in their own tongue. When a choir sang “Come, Come Ye Saints,” I thought of them being far away from their homes and bearing their testimonies through song, just as the pioneers did. America was mentioned by all six speakers during the fireside. In fact, it was mentioned so many times that I later I asked if there was a Kirbati word that sounded like America. They really were all talking about America – about getting an education, the gospel being restored, and Church leaders there. I marveled that a people this far from the shores of the United States would be so influenced by it. I’m thankful America was preserved and prepared so the restoration of the gospel could take place, and bless the lives of the people here. One word I did understand in the closing prayer was “refreshments!” Tetika and Tawatia helped make some great Kiribati desserts. We even had our first taste of Pandanus fruit in something they made similar to a fruit roll up – YUM! See what I mean? I hope the world lasts at least until we get home in 2016 – we just have way too many things to still discover!